Americans today are frustrated and anxious. Our economy is sluggish, and leaves workers insecure. Income inequality, cultural divisions, and political polarization increasingly pull us apart. Our governing institutions often seem paralyzed. And our politics has failed to rise to these challenges. No wonder, then, that Americans--and the politicians who represent them--are overwhelmingly nostalgic for a better time. The Left looks back to the middle of the twentieth century, when unions were strong, large public programs promised to solve pressing social problems, and the movements for racial integration and sexual equality were advancing. The Right looks back to the Reagan Era, when deregulation and lower taxes spurred the economy, cultural traditionalism seemed resurgent, and America was confident and optimistic. Each side thinks returning to its golden age could solve America's problems. In The Fractured Republic, Yuval Levin argues that this politics of nostalgia is failing twenty-first-century Americans. Both parties are blind to how America has changed over the past half century--as the large, consolidated institutions that once dominated our economy, politics, and culture have fragmented and become smaller, more diverse, and personalized. Individualism, dynamism, and liberalization have come at the cost of dwindling solidarity, cohesion, and social order. This has left us with more choices in every realm of life but less security, stability, and national unity. Levin argues that this calls for a modernizing politics that avoids both radical individualism and a centralizing statism and instead revives the middle layers of societyfamilies and communities, schools and churches, charities and associations, local governments and markets. Through them, we can achieve not a single solution to the problems of our age, but multiple and tailored answers fitted to the daunting range of challenges we face and suited to enable an American revival. Yuval Levin is the Hertog Fellow at the Ethics and Public Policy Center and the founder and editor of National Affairs. He is a former White House and congressional staffer and a contributing editor to National Review and the Weekly Standard. He lives in Maryland. "Compelling.... Yuval Levin has written an incisive and irenic critique of contemporary American society, together with a series of reflections that offer a way forward without trafficking in the false hope of 'solutions.' That he has done so in fewer than 250 pages of clear, well-organized prose ought to make the book famous for a generation. Maybe, in time, we can stop asking why the former days were better than these." "Mr. Levin is among the Republican Party's great intellectual leaders and has proposed a new direction for conservatism. We'll soon learn whether the party's political leaders follow his wise advice." "Amid the confusion and clamor, Yuval Levin's The Fractured Republic stands out as a penetrating diagnosis of the emerging fault lines in American society." Superb.... The Fractured Republic is not a manual or blueprint for reform, and it does not offer a checklist of repairs to make America whole again. Instead, it merges a deep philosophic understanding of the American experiment and a conceptual analysis of American history into a practical basis from which we can examine contemporary American problems with crystalline clarity. Levin calls his book an 'essay,' and it provides the bracing shock of illumination that is the hallmark of all great essays." "[This book] couldn't have come out at a better time. The Fractured Republic is half diagnosis and half prescription. And both halves are essential reading, especially as we contemplate what the current election means for our body politic." "In a bleak political year, there comes a shaft of light in the form of an extraordinary new book, The Fractured Republic.... [Levin] is among America's most important and humane conservative thinkers. Yuval Levin's brilliant new book offers social conservatives a more effective approach to social engagement not only because it's more positive but because it's more true, because it appeals to people on a deeper level, because offering people a healing grace and hope is what is likely to be especially attractive and powerful in this time of disorientation, distemper, and confusion." A gracefully written, big-picture analysis of American society and politics." 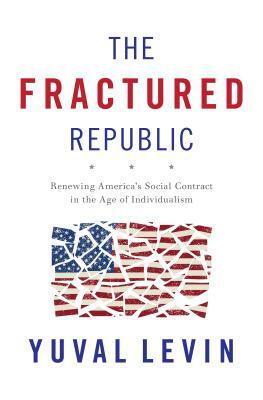 "There are just a few essential reads if you want to understand the American social and political landscape today.... Today, I'd add Yuval Levin's fantastic new book, The Fractured Republic...I learned something new on every page." Instead of desperately trying to go back in time to recover lost unity, Levin urges citizens to look forward as well as downward, to improve the cultural patch around them. This future orientation may seem like an odd message for a conservative, and it is all the more powerful for coming from one. The goal is not to make America great... again. It is to make America great in a distinctly 21st-century way."